THE Constitution and Legal Parliamentary Committee Chairperson, Ms Pindi Chana, has underscored the need to incorporate environmental conservation in the new constitution. 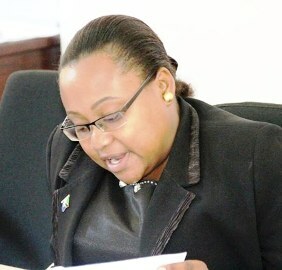 Speaking in a seminar on climate change on Sunday, Ms Chana said it was disappointing that the current constitution does not spell out environmental management issues despite being cross cutting, thus needing premeditated efforts.She said Tanzania was among members of the Kyoto protocol yet the country had no provision safeguarding a healthy environment. “There are many efforts embarked on to ensure that we fight against rapid climate change but what disappoints is that the current constitution does not contain any provision on environmental conservation,” she said. For the efforts to be effective, she appealed for existence of laws in the constitution on environment. She insisted that all councils were supposed to have by-laws to that effect. Ms Chana also said that it was high time government ensured that funds for environmental conservation does not depend on donors but come from internal sources. The Environment Assistant Director in the Vice President Office, Mr Richard Myungi, said that climate change was a serious problem which if immediate efforts were not taken, the country would incur many losses including severe food insecurity. Mr Myungi who also doubles as the chairman of a subsidiary body of scientific and technological advice of climate change convention said it was estimated that by 2050 there would be massive urbanization thus it was necessary to fight hard to ensure that the country is not rocked by climate change impacts. He appealed to the legislators to ensure that they take up their roles in advising the general public on good environmental management, considering that they have high degree of trust and mobilization. “We believe that MPs could play a pivotal role considering that many countries in the world have been severely hit by climate change. In Tanzania, the problem is growing and we are, therefore, obliged to fight tooth and nail to rescue this generation from the dreadful climate change,” Mr Myungi said. The United Nations Development Programme (UNDP) Climate Change Advisor, Mr Amani Ngusaru, drew attention to allocation of adequate funds for addressing climate change noting, allocating meagre budget to address it was an obstacle to ensuring that the country is not affected by climate change.He said that it was less expensive to maintain the environment than addressing climate change effects. Categories: Local | Tags: bunge, cc, constitution, dailynews, katiba, muyungi | Permalink.